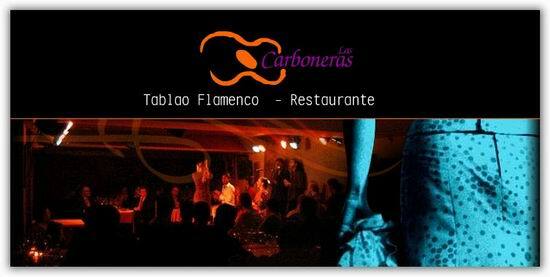 Las Carboneras is a flamenco restaurant offering Spanish cuisine. The average price of a 3-course meal at the Las Carboneras restaurant is 60 euros. Note that although GoMadrid.com strives to maintain all information about Las Carboneras up to date, the prices mentioned are only an indication and may not reflect the exact value of your meal. Flamenco lovers will feel at home in the Tablao Las Carboneras in the central historic neighbourhood of Madrid, the 'Madrid de los Habsburgs', the oldest part of the capital. As well as offering a wide range of flamenco exhibitions and performances with the best contemporary dancers, diners can enjoy typical and traditional Spanish dishes with a touch of creativity. There are four menus, one of which is a tapas menu for groups that includes sand eels with port, pork loin with a sweet and sour sauce, or swordfish with coriander, avocado and tartare sauce. The average price is 60 euros, which includes the show. The address of the Las Carboneras restaurant is: Plaza del Conde de Miranda, 1, 28004 Madrid. The nearest Metro station is Opera. Please see the Las Carboneras restaurant location map below.